While air strikes in Afghanistan continue to rise as the year progresses, the statistics for last month show a drop from this time last year. 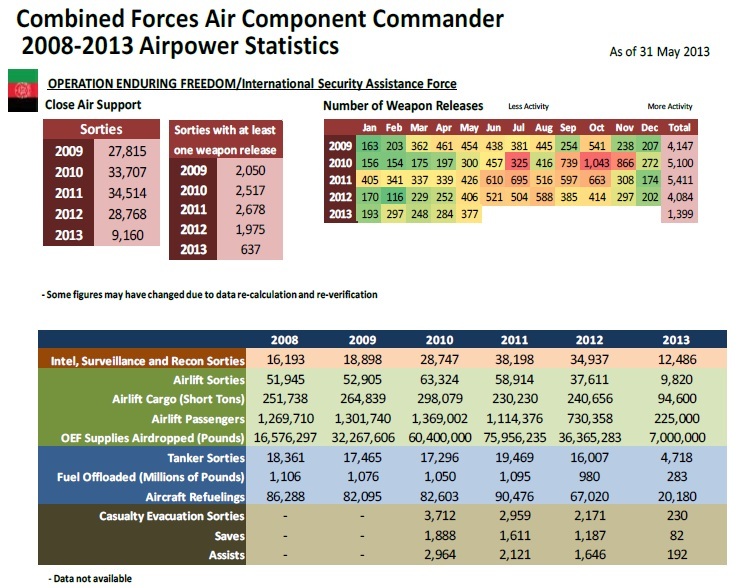 In May, ISAF aircraft have released 377 weapons compared to 284 the month before, according to Air Forces Central Command statistics released today. There were 406 in May 2012. So far this year, there have been 9,160 close air support sorties with 637 including at least one weapons release. As we reported earlier this year, the AFCENT statistics continue to leave out weapons release from remotely piloted aircraft. The Air Force previously released the data, but stopped in March. The data is available through the Freedom of Information Act, and our request is pending.